For young children, two of the most important tasks they face are learning how to communicate and learning how to think about themselves and the social world around them. The premise of this book is that these two tasks are inherently linked. The communicative routines and language that children learn enable new modes of cognition, which in turn allow for more complex social interactions. The model of early child development that emerges is one in which equal importance is given to the socio-cultural context in which children are developing, and to the role played by children in actively constructing their own knowledge. The book is organized into four thematic sections, each introduced by an integrative overview. The first section, "Language and Cognition," examines the function of language in young children's lives. The second section, "Intentionality and Communication," explores young children's understanding of intentions and their verbal and non-verbal communication. The third section, "Theory of Mind and Pedagogy," examines the ways in which developments in cognitive and communicative skills transform children's participation in the process of teaching and learning. The final section, "Narrative and Autobiographical Memory," looks at the effects of narrative on young children's understanding of themselves and their world. This book will be of great interest to anyone concerned with young children's learning and development. "…the book is a valuable contribution to researchers interested in development and communication. Because of the interdisciplinary nature of this area of research, the book's ultimate value may be in stimulating interest on the topic and future research. 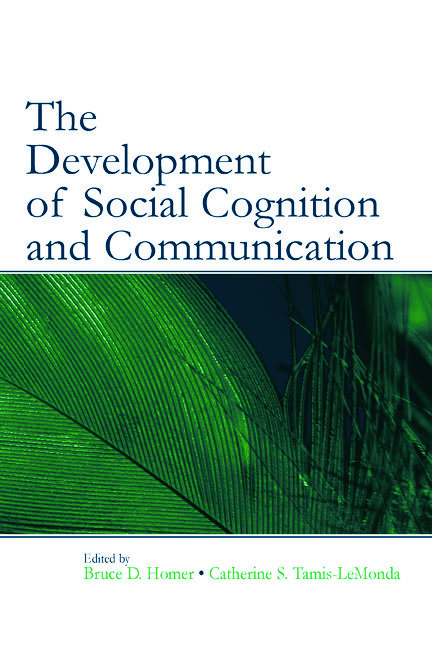 The book could easily be used for a graduate course on the development of communication…." Contents: B.D. Homer, C.S. Tamis-LeMonda, Preface. D.R. Olson, Foreword. Part I: Language and Cognition. B.D. Homer, C.S. Tamis-LeMonda, Section Introduction. K. Nelson, Cognitive Functions of Language in Early Childhood. B.D. Homer, K. Nelson, Seeing Objects as Symbols and Symbols as Objects: Language and the Development of Dual Representation. S. Jacques, P. Zelazo, On the Possible Roots of Cognitive Flexibility. Part II: Intentionality and Communication. C.S. Tamis-LeMonda, B.D. Homer, Section Introduction. A. Walker-Andrews, Perceiving Social Affordances: The Development of Emotional Understanding. D. Baldwin, Discerning Intentions: Characterizing the Cognitive System at Play. C.S. Tamis-LeMonda, K. Adolph, Social Referencing in Infant Motor Action. N. Akhtar, Is Joint Attention Necessary for Early Language Learning? C. Moore, D. Symons, Attachment, Theory of Mind, and Delay of Gratification. Part III: Theory of Mind and Pedagogy. B.D. Homer, C.S. Tamis-LeMonda, Section Introduction. J. Astington, J. Pelletier, Theory of Mind, Language, and Learning in the Early Years: Developmental Origins of School Readiness. D. Frye, M. Ziv, Teaching and Learning as Intentional Activities. S. Goldin-Meadow, Gesture in Social Interactions: A Mechanism for Cognitive Change. Part IV: Narrative and Autobiographical Memory. C.S. Tamis-LeMonda, B.D. Homer, Section Introduction. J. Brockmeier, Pathways of Narrative Meaning Construction. R. Fivush, C.A. Haden, Parent-Child Reminiscing and the Construction of a Subjective Self. M. Leichtman, Q. Wang, Autobiographical Memory in the Developmental Niche: A Cross-Cultural Perspective.